Yes, it’s true: you can learn how to be a verbal wizard! Ever hear someone utter an unforgettable phrase and feel yourself reacting with with…well, *awe? * Ever read a great quote and think I could never come up with anything that clever? Daunting as it may seem, there’s nothing mystical about witcraft. Crafting memorable lines doesn’t require DNA-encoded brilliance. What it does require is some knowledge of the tricks and techniques that make words stick. 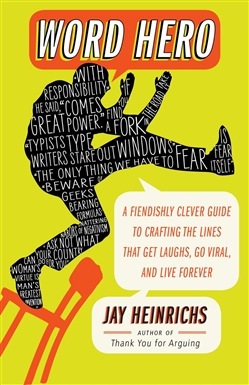 In Word Hero, Jay Heinrichs rescues the how-to of verbal artistry from cobwebbed textbooks and makes it entirely fresh– even a little mischievous. Fear not: on offer here are not dry, abstract ideas couched in academic jargon. Rather, Heinrichs takes you on an amusing – and amazingly helpful – tour of the mechanisms that make powerful language work. You’ll learn how to slyly plant your words in people’s heads and draw indelible verbal pictures by employing such tools as “crashing symbols,” “rapid repeaters,” “Russian Dolls” and even the powers of Mr. Potato Head. With those tools and others tucked in your utility belt, you might not immediately achieve “wordsmith immortality” but you will become a better speaker, writer, and raconteur…and long after people have forgotten everything else, they’ll remember your priceless lines. Acquista Word Hero in Epub: dopo aver letto l’ebook Word Hero di Jay Heinrichs ti invitiamo a lasciarci una Recensione qui sotto: sarà utile agli utenti che non abbiano ancora letto questo libro e che vogliano avere delle opinioni altrui. L’opinione su di un libro è molto soggettiva e per questo leggere eventuali recensioni negative non ci dovrà frenare dall’acquisto, anzi dovrà spingerci ad acquistare il libro in fretta per poter dire la nostra ed eventualmente smentire quanto commentato da altri, contribuendo ad arricchire più possibile i commenti e dare sempre più spunti di confronto al pubblico online.